First you need to accept the fact that trading is simple, and the market is not your problem. The real problem is the way you see and perceive the market as your problem. Actually, no one trades the market. We all trade our own belief systems. If you see the market as a dangerous and threatening creature, it will be so. And if you see the market being friendly, it will be so. Therefore, the way your brain works makes you a winner or a loser. 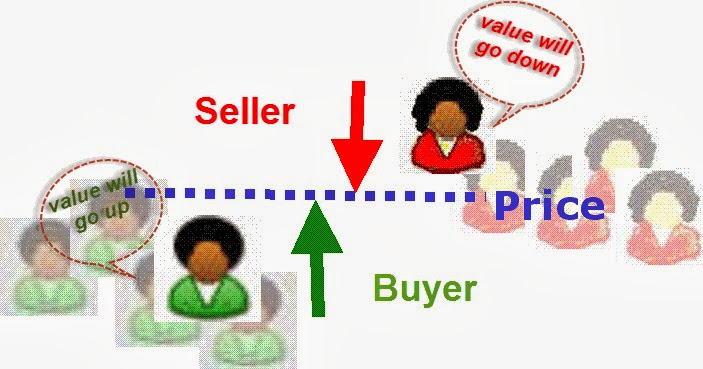 Basically, the market in its simple and deep picture is created by people who disagree on value and agree on price. I buy a commodity because I see that its value will go up. And, vice versa, I sell this commodity because I see that its value will go down. You and I agree on the current price, but disagree on a future value. The market always searches and finds the balance point to define the exact price, where there is an absolute balance between the power of buyers and sellers. So the market is a mirror of our beliefs and decisions. The market is also a source of information. Thus, you shouldn't listen to anyone, even experts or analysts. You should listen only to the market itself. 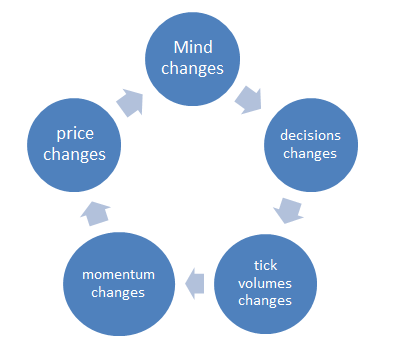 The market gives us enormous amount of information every moment – time, price, and volume. Volume is the pulse of the market, when the volume beats, everything moves. The volume changes before the price changes as a response to traders' decisions. I restate that the market is a mirror of our beliefs and decisions. Let's talk about trading. 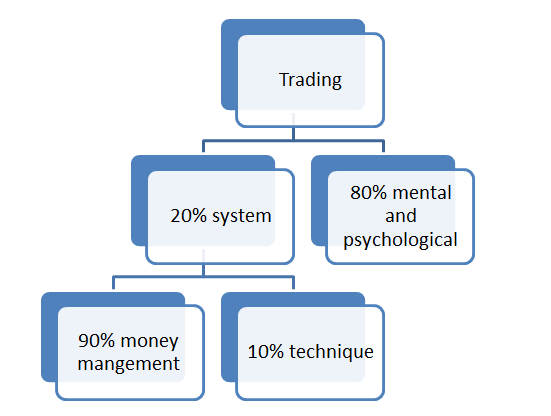 In fact, trading is primarily a psychological and mental game. So, to a greater extent, technical and fundamental analyses don’t work appropriately. For example, technical analysis is built on the premise that the future will be similar to the past. In my opinion, it is wrong to depend on technical analysis in trading. We may use it in discussing expectations and predictions of the future, but trading is different. The reality is that the fu­ture can’t repeat the past. If you want to consider a certain technical pattern to be the same now as it was in the past, you will need to bring the same traders from the past. Moreover, they should have the same aims, the same capital, the same state of mind, and the same beliefs. Is it possible? On the contrary, it is exactly impossible. So, almost nothing turns out as expected. That is, certainly, the difference between analysis systems and trading systems. The analysis systems make us go to the past, and then jump into the future thinking of predictions. But trading systems make us stay in the current moment and act according to our plan at present. Since the market is unpredictable, we must approach trading with a method that doesn't require any predictability. Now, let's take an example. 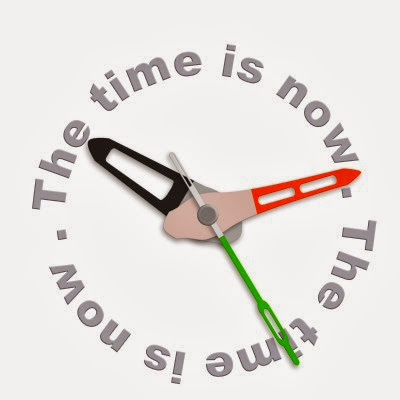 When you want to carry out some work, you will need a tool or technique that helps you to accomplish your tasks. At first, you will feel that this tool is unfamiliar, and hard to use – you always think of every step of using steps. After few times of using, it becomes more familiar and easy to use – your brain gets used to applying this tool. After several times of its usage, you gain understanding and experience in using this tool to such an extent that you no longer think about any step of using steps. And at the same time you achieve a consistent outcome. Of course, the things are true with regard to trading. We need a tool or a technique (trading system) to achieve a consistent outcome. We must have the right understanding and the right attitude to using the right tools. After that, what all we have to do is to follow the rules. Success in trading cannot be achieved without consistency. Consistency depends on patience, adherence, and discipline. Every time we take a trade following the rules of our system, we move one step closer to our success. In the beginning, it might be unfamiliar and not easy. But, when we are disciplined, following the rules and repeating the same process over and over, day after day, week after week – we will habituate ourselves and our minds to trade successfully, respect the rules, and establish our own belief system. Look back on you trying to ride a bicycle for the first time in your life. Don't tell me how many times you fell, or suffered when learning to control balancing, turning, and pedaling. But tell me how you could finally master riding, disregarding the sufferings, and how you could gain skills in bicycle riding. It is important to emphasize that our responsibility in trading is only to follow the rules that are established to facilitate the process of trading. We should stop blaming the market and feeling betrayed. Remember, the market is not your problem. The real problem is your perceptions of the market. 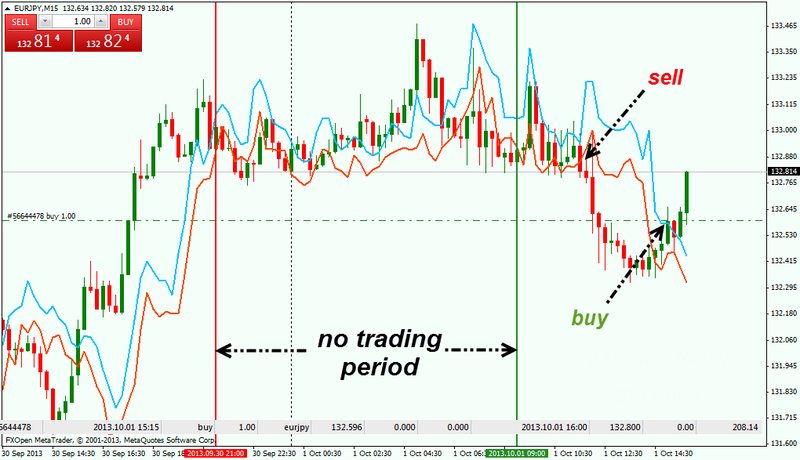 Forex and trading in general offer fantastic opportunities for making profits. Moreover, it may be the last chance of free enterprise. That's why unlike employees who usually face such problems as bossy managers, salary limitations, or the risk of redundancy, many people are interested in a risky business like trading. Also, business owners face such problems as workers' complaints, taxes, or business failure caused by the facts outside business owners’ control. The uniqueness of trading is that it offers us personal and financial freedom. But, is trading really risky?! Yes, there is risk in trading. There is also risk in every aspect of our lives. The risk is found in most of our activities: car driving, travelling by plane, swimming, and even walking on the street. However, no one stops driving a car, no one stops travelling by plane, etc… We continue walking on the street or swimming. The reason is that we have got used to it and our minds have been trained to accept the risk. Consequently, we gain understanding and experience to deal with the risk. 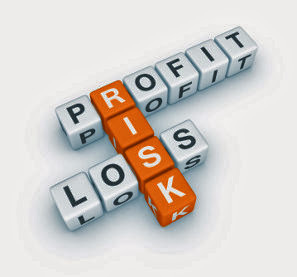 In trading, we create risks to create profits. So, you shouldn't be scared, you have to accept the risk so that you could think as a successful trader. We can control the risk by setting our own plan and sound capital management. If we trade without a well-defined plan, we will find ourselves on the seesaw of losing and winning. There will not be consistency or success – we will be in the state of fear, anger, frustration, anxiety, disappointment, betrayal, resentment, suffering, unhappiness, and regret. Successful trading requires patience, discipline, having a well-defined plan, following the trading system rules without violating the money management rules. 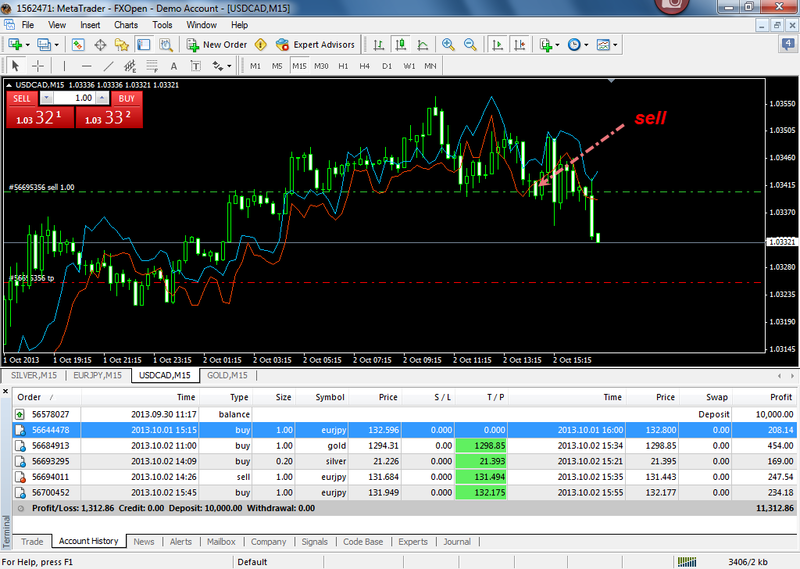 Now, I will illustrate quickly an example about following the rules, whatever the strategy is. 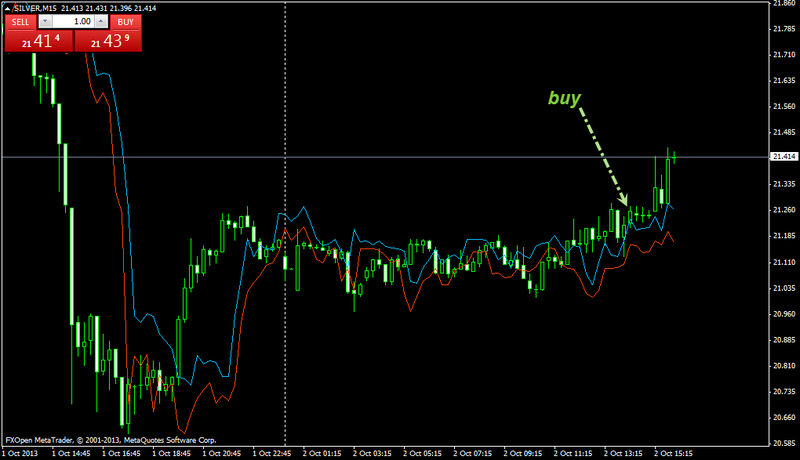 The following is 15-minutes’ chart of EUR/JPY, with a simple strategy that I used before. What are the rules? When a candle closes above the blue line, one should go long, and when a candle closes below the red line – go short. The trading period is between 6.00 and 18.00 GMT. The target is 15-20 points, stop and reverse when the candle closes on the other side. It is extremely simple, isn't it? Well, let's see more charts. As for me, I follow the rules whatever the strategy is. Honestly, this doesn't mean that by following the rules, there will not be any losing trades. It is possible that you might lose some trades. But there is nothing one can do about it. You must know that loss is part of the game. So what you have to do is to accept losses, and patiently wait for next trade. Recall that market is simple. Trading is profitable. It is a psychological and mental game. You must stay in the NOW moment and not go back to the past or jump into the future. 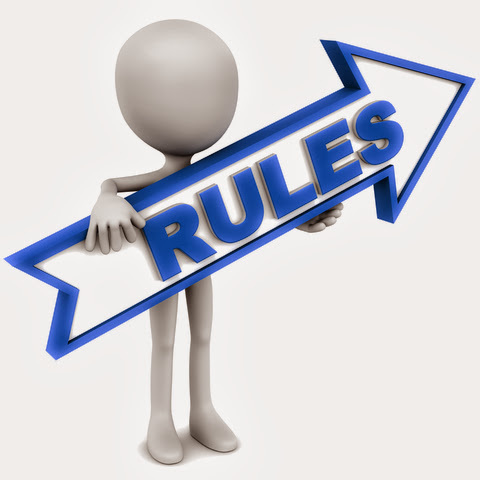 To be a successful trader, you must follow the rules and only the rules. Every trade is an achievement as long as it is taken according to the rules of your system. It won’t be an achievement if you make big profits without following the rules. As time goes on, your mind is habituated to take over the trading process automatically, so that you could have fun and funds. You will have a good time, good trading, and good feelings with no fear, no anger, and no stress. It sounds simple, but without consistency and following the rules it will not be easy. Trading doesn't have to be difficult, and it can be very re­warding. Learn to depend on yourself in trading. Nothing begins until you decide it should begin It will last as long as you want, and it will not end until you want it to be over. 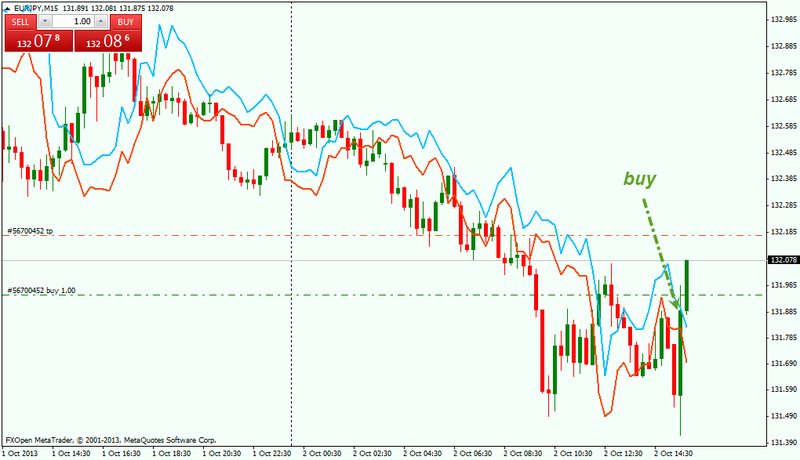 The article is written by Ahmed Mohamed and is participating in the Forex Article Contest. Good luck!